Groove is #1 Sales Engagement Platform for Salesforce & Gmail Users, and have empowered over 40,000 reps at leading companies around the globe. Groove is a sales engagement software built for inbound and outbound sales teams. It helps your sales representatives spend more time on closing deals by streamlining each stage of your sales process. Groove’s feature set is configured to match the needs of each team in your sales organization — sales leaders, sales operations, and sales reps — while keeping your data consistent in a single, centralized platform. Groove requires a minimum of 5 users in your sales team. 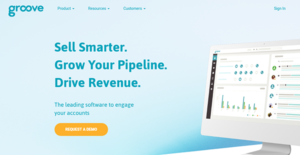 It specializes in helping your salespeople grow your pipeline, engage your accounts, boost your revenue and sell smarter. This platform also equips all the vital features you need to get your hands on data-driven insights and actionable analytics to enhance your sales processes and productivity. Its products include email and calendar integration, campaign automation, sales analytics, sales productivity, account-based sales, and built-in dialer. As a trusted Salesforce partner, Groove’s deep integration with the leading CRM solution saves you time and money as it syncs information between the systems seamlessly and automatically. This means you can quickly access the data you need and trim downtime in moving from one system to another. Tracking results with full visibility and communicating your accounts are optimized in the software to drive efficiency and revenue. Groove helps you ensure your campaigns are not only timely, but it should maintain quality communication as well. Building multi-step campaigns, called “Flows” in Groove, is accomplished with ease. It gives you a high-level view on which Flows are engaging or not and drill down to see who among your prospects are responding. This makes sure you deliver the right message to the recipient at the right time. It also takes care of sending follow-up messages to leads and collaborating with your entire team. Eliminate the time-consuming and tedious process of manual data entry with Groove’s integration with Salesforce. Email and calendar records are synced automatically to make sure your accounts are always up-to-date. You have to option to choose which emails to sync or to push all emails into Salesforce in logging inbound and outbound emails in real time. Groove also collects data to give you visibility on how your sales team is spending their time. Driving productivity can also be achieved with the software’s solutions such as email tracking, templates, reminders, scheduled email deliveries, and meeting scheduler. This is crucial to ensure you don’t miss anything while maintaining visibility over each aspect of your sales process. Groove also has a built-in dialer where you can immediately connect from Gmail, Flow or Salesforce. Groove provides you with analytics on what’s working and not working so you can find the right solutions to enhance or fix it. This includes templates for email and call scripts and sales activities. If they are effective, you can easily share them with the rest of your team. If they are under-performing, you can immediately find ways to fine-tune them. Analytics give you detailed real-time insights such as which time and day have the highest connect rates and account-based engagement scores. By using Groove’s account-based engagement data, you can get a comprehensive look of the account you’re targeting to ensure you are engaging them optimally. Prioritizing accounts is streamlined with star or label assignment, filtering and advanced search for your team to focus on. You also see a detailed view of each account’s engagement history to approach them accordingly. Enterprises have diverse needs and requirements and no software solution can be just right in such a scenario. It is useless to try to find an ideal off-the-shelf software system that meets all your business needs. The smart thing to do would be to customize the solution for your special requirements, staff member skill levels, finances, and other aspects. For these reasons, do not hasten and invest in well-publicized leading systems. Though these may be widely used, they may not be the ideal fit for your particular needs. Do your homework, investigate each short-listed system in detail, read a few Groove reviews, contact the seller for clarifications, and finally settle for the app that provides what you want. Groove pricing is tailored to your specific business needs. Your sales team should have a minimum of 5 users to use the software. Contact the vendor to request for a demo and quote. We realize that when you make a decision to buy Sales Software it’s important not only to see how experts evaluate it in their reviews, but also to find out if the real people and companies that buy it are actually satisfied with the product. That’s why we’ve created our behavior-based Customer Satisfaction Algorithm™ that gathers customer reviews, comments and Groove reviews across a wide range of social media sites. The data is then presented in an easy to digest form showing how many people had positive and negative experience with Groove. With that information at hand you should be equipped to make an informed buying decision that you won’t regret. Great tool for B2B lead Management and Automation! What are Groove pricing details? What integrations are available for Groove? Pros: I personally love giving my clients the opportunity to have their input regarding scheduling appointments with me. Cons: Logging emails seems to be a little bit glitchy at the moment, and I find that I have to manually log a few, but not too many. Normally resetting the settings clears this out for a while. Pros: Creating templates for common responses is a great way to stay efficient in correspondence and track who's opening those emails. Having visibility on open and click rates is a great way to know if your message is resonating. Also, the ability to sync communication with Salesforce is fantastic for CRM. Cons: It would be great to see a break down in individual template performance. While seeing open rates and click through percentages is nice from a performance standpoint, being able to export a file of contacts that have done either would be helpful for follow up communication to targeted interested parties. I personally love giving my clients the opportunity to have their input regarding scheduling appointments with me. I find extremely useful the email analytics, open/clicked-on links and replies. Groove is a great tool to connect to SFDC while working within Gmail. The overall ease of use and the email templates with the ability to track effectiveness. Ability to track email opens, auto reminders to follow up with unanswered emails, goove flows for prospecting. I love that it tells me when me emails are opened and how many times they're opened. I love the custom time of the emails feature.